Diana Rattray. The Spruce Eats, 2009. Have you ever heard the saying, "Bacon makes everything better"? 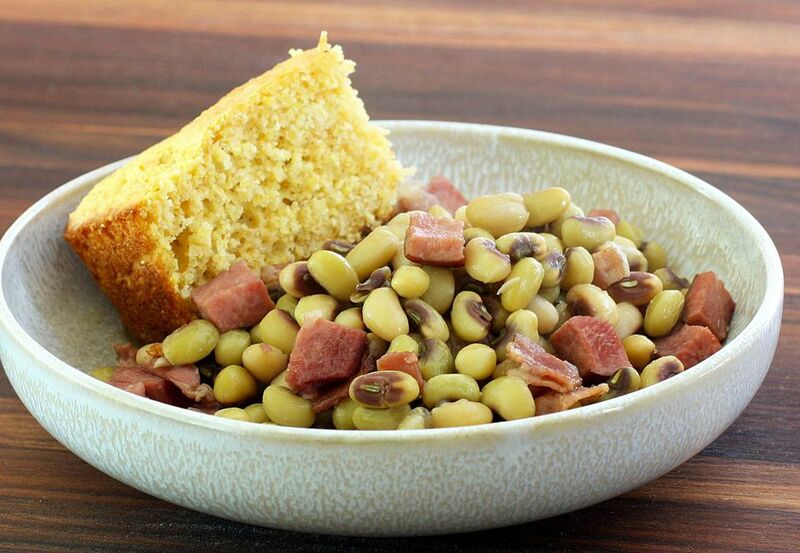 Well, this dish is a combination of purple hull peas and bacon. But, that's not all. There's ham in it as well. It's a perfect dish to have during lunch or even dinner. Cook the bacon in a skillet or microwave until almost crisp. Remove to paper towels to drain — heat olive oil in a large saucepan over medium heat. Add onion and ham and cook, stirring, until onion is tender and lightly browned. Add garlic and cook for 1 minute longer. Add the bacon, chicken broth, and peas and bring to a simmer. Reduce heat to low, cover, and simmer for 50 to 60 minutes, or until peas are just tender. Remove cover and increase to medium-low; simmer for 5 to 10 minutes longer.